Jennifer Fallon’s first novel of The Demon Child Trilogy immediately became a bestseller and was short-listed for the Best Fantasy of 2000 Aurealis Award (an award for Australian SciFi/Fantasy/Horror authors). Fallon has a Masters Degree from the Creative Arts faculty of QUT. A computer trainer and application specialist, Fallon currently works in the IT industry and spends at least a month each year working at Scott Base in Antarctica. Because she’s Australian, her novels are sometimes released there first. 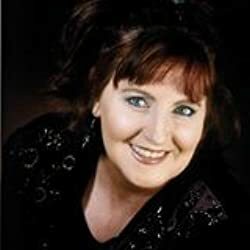 For country-specific release dates, see Jennifer Fallon’s website. Click here for more novels by Jennifer Fallon. The Hythrun Chronicles — (2000-2016) Publisher: According to legend, the last king of the Harshini sired a half-human child, known as the Demon Child, born to destroy a god… The Sisterhood of the Blade rules Medalon with an iron fist — an iron fist within the steel gauntlet of the Defenders, elite warriors sworn to uphold the sisters and keep Medalon free of heathen influence. R’shiel, daughter of the First Sister of the Blade, has pulled against the short leash of her mother ever since she was a child. Her half-brother, Tarja, is the dutiful son who serves as a Captain in the Defenders. But when they run afoul of their mother’s machinations, they must flee for their lives. 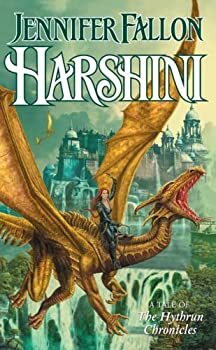 They soon find themselves caught up in the rebellion against the Sisterhood, though they revile their fellow conspirators heathen belief in the Harshini — a fabled race of magical beings thought long extinct. 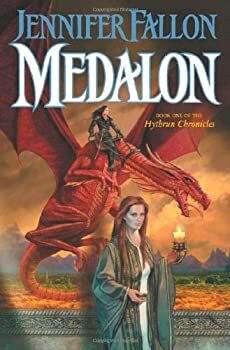 But then Tarja and R’shiel encounter Brak, an Harshini outcast, who forces them to face the most shocking fact of all: the Demon Child, thought to be nothing more than legend, may have been loosed in Medalon. 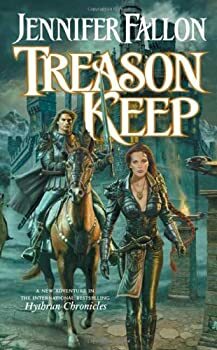 Treason Keep, the sequel to Medalon, is more of the same: a fast pace and fun characters overshadow the not-so-tight plot. Sure enough, just like my daughter's tower, in Harshini, it all comes crashing down. 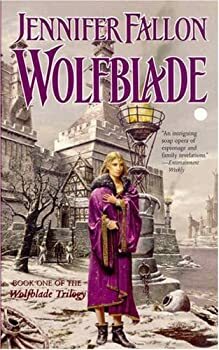 Wolfblade is the first book in Jennifer Fallon’s WOLFBLADE trilogy which is a prequel to her DEMON CHILD trilogy which I read several years ago. These are fat epic fantasies with lots of characters that are focused mostly on political drama but also contain plenty of magic and romance. Warrior is the second installment in Jennifer Fallon’s WOLFBLADE trilogy, a prequel to her DEMON CHILD trilogy. Both trilogies make up the HYTHRUN CHRONICLES. 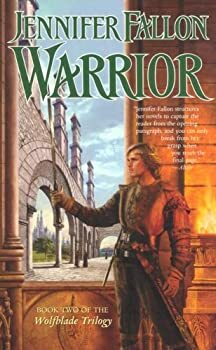 In the first book, Wolfblade, which you’ll definitely want to read before picking up Warrior, we were introduced to Marla Wolfblade, sister to Lernen Wolfblade, the High Prince of Hythria. When we first met Marla, she was a bubble-headed blonde teenager dreaming of marrying a handsome warlord. At the end of the very long (600 pages, 25 hours in audio format) story, Marla had become a cynical and savvy politician and the most powerful woman in Hythria, thanks to her dwarf slave and a series of unfortunate politically-motivated disasters including adultery, betrayals, kidnappings, and assassinations. 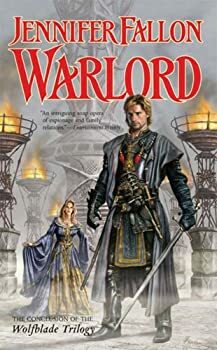 Warlord is the last book in Jennifer Fallon’s WOLFBLADE trilogy which is a prequel to her DEMON CHILD trilogy and part of her HYTHRUN CHRONICLES. Like its predecessors, Wolfblade and Warrior, it’s a huge sprawling epic (26 hours on audio). The story starts immediately after the tragic events of Warrior (which you really must read first). Marla is still the wealthiest and most powerful woman in the country, but she has taken a major hit and, in some ways, feels alone, despite her large family. Second Sons — (2001-2004) Publisher: On the world Ranadon there is no night as both suns shine brightly. The intervention of Belagren, High Priestess of the Shadowdancers, and the sacrifice of a child of royal blood, has banished the Age of Shadows from the skies. Belagren’s position is unquestioned… until circumstances begin to tip political rivalries into a deadlier game altogether. A volcanic eruption rocks the seas separating the Kingdom of Dhevyn and the mainland Kingdom of Senet, and a mysterious sailor is shipwrecked on the island of Elcast. Badly wounded, his arrival stirs up old hatreds and unravels old secrets. His presence is enough to even bring Antonov, the powerful Lion of Senet, to the island and fear to the Keep of the Duke of Elcast. A strong friendship develops between Dirk, second son of the Duke, and Kirshov Latanya, second son of the Lion of Senet. But will they, and their friendship, survive the chain of events set in motion by the ambitions of the ruthless High Priestess of the Shadowdancers and the domineering Lion of Senet? The Tide Lords — (2007-2009) Publisher: When a routine hanging goes wrong and a murderer somehow survives the noose, the man announces he is an immortal. And not just any immortal, but Cayal, the Immortal Prince, hero of legend, thought to be only a fictional character, a figure out of the Tide Lord Tarot, the only record left on Amyrantha of the mythical beings whom the part-animal, part-human Crasii believe created their race. Arkady Desean is an expert on the legends of the Crasii. At the request of her childhood friend, Declan Hawkes, the Kings Spymaster, she is sent interrogate this would be immortal, hoping to prove he is a spy, or at the very least, a madman. Set the task of proving Cayal a liar, Arkady’s own web of lies, and that of her husband and the King’s Spymaster will start to unravel. Nothing is really as it seems around Cayal, the Immortal Prince — the lies seem plausible, his stories improbable and truth more than any of them bargained for. Rift Runners — (2012-2014) Publisher: The Undivided are divided. The psychic twins, Ronan and Darragh, have been separated by the traitor Druid, Amergin, who has kidnapped Ronan and thrown him through a rift into another reality. Now time is running out for Darragh. If Ronan isn’t found soon, they will both die. But his twin brother is lost in a reality where Druids are legend, and there is no magic. Somehow, before the Autumn Equinox, they must find one young man in a world of six billion people… Meanwhile, Ren Kavanagh has no notion of where he comes from. He is plagued by strange injuries that appear from nowhere and everyone is convinced he is deliberately harming himself for attention. Then he meets the enticing and mysterious Trasa, and before he can figure out how it happened, he is in serious trouble – arrested for arson and possibly murder. Rescue will come from a completely unexpected direction. Ren is about to discover more about his origins than he bargained for, meet the twin brother he never knew he had, and discover nobody is what they seem, especially his new friend, the half-faerie, half-human Trasa… Amergin’s daughter.